This is one of the best vintage chronographs that i can think of! Of course you could say that a vintage “Paul Newman” Rolex Daytona is way better, but let’s take a look at this beautiful timepiece. This is THE vintage automatic Citizen chronograph, Challenge Timer, also known as bullhead, Easter rabbit or Mikey Mouse – due to its particular shape. It was first introduced in 1978. (on the caseback the first digit of the serial shows the year and the next two digits are for the month) The reference number is Citizen 67-9356. Regarding the shape, you can instantly see that this is not like all the other bullheads. This one has a beautiful octagonal shape that gives it personality, masculinity and a lot of refined power. The case is made of brushed and polished stainless steel and the case back screws into place. The round bezel is polished and the glass crystal is flat. The shape of the watch is octagonal with the lower part dropping towards the bracelet and the upper part, flat, hosting the crown and two push buttons that operate the chronograph function. The winding crown is a little bit longer than the usual so that it can be operated due to the special case design. It is signed “CTZ”. Back to the shape of the case: – all the frontal part is brushed, from top to bottom. The top flat surface is also brushed but from side to side. The sides of the watch are mirror polisher reflecting the light in unexpected, beautiful ways. The caseback is also polished. The case alone has on the visible side alone, 21 different surfaces, not counting the bezel, crown and buttons so the visual effect of brushed and polished surfaces, with a lot of angles, gives a powerful feeling. The dial is classic, with three contrasting subdials positioned at 3, 6 and 9. There are only two types of dial colors for this model – black with white subdials and white with black subdials. (The metal base round case model has a lot of variation in dial color but for this model we have only black and white.) A lot of “restorations” are with aftermarket dials, so pay attention on this aspect when thinking of buying a Citizen chronograph. The indexes of the dial should be raised but the luminescent dot (green) should be on a lower part of the applied index. The Citizen logo is also applied. The hands are painted to better contrast with the dial. The subdial at 3 counts the elapsed minutes (30), the one at 9 – the hours(12) and for the seconds we have the central hand. The subdial at 6 is for the day and date. The day is in two languages, and sundays are painted red. For the white dial version the day and date wheels are black and for the black dial the wheels are white. This gives them a better integration in the general design. On the outside of the dial we have the classic tachymeter. The movement is the Citizen automatic, 23 jewels, calibre 8110A with hand winding capability. It was produced by Citizen starting from 1972. 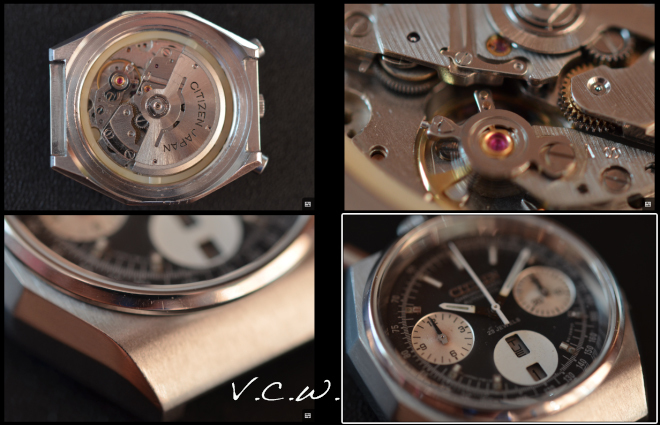 It is a vertical clutch chronograph (beating at 28.800 bph) with column wheel and fly back function. (how many modern chronograph do that, and what is their cost?) Lets don’t forget it has a day and date indicator. The fly back function means that you can reset the chronograph while in motion and it will start again without needing to go the entire process of pressing stop-reset-start. So, one push can do all of this. Of course that if you want to stop it you can go the classic stop-reset way. A particularity for this movement is that when you want to change the day you should pull the crown to second position (for changing the date) and push and release the reset (1 o’clock) button. It is 27 mm wide and 6.9mm high. The column wheel/vertical clutch design of the movement advices to leave the chronograph running for most of the time (this way you can also see the beautiful sweeping central second hand in movement), but from time to time it should be stopped. This is a chronograph that needs to be used. It is not made for design purpose but for timing. The bracelet (i saw different models but the one on the black dial in pictures is 100% sure it is original to the watch, and my favorite design for this model) is stainless steel, wider where it connects with the case and narrowing towards the signed “Citizen” stainless steel clasp. Each link is made of only one piece. Pay attention that most of aftermarket bracelet are with full links, the original is made of folded steel. Conclusion: Beautiful to wear, beautiful to look at, interesting special design, wonderful automatic fly back chronograph movement that needs to be used… what else to ask for a vintage chronograph? This entry was posted in automatic, Citizen automatic chronograph, Citizen chronograph, day-date, hand winding, vintage Citizen and tagged 23 jewels, 8210A, Brushed metal, Challenge Timer, Chronograph, citizen, Citizen chronograph, Citizen Holdings, citizen octagon, citizen octagon chronograph, Clock, day-date, fly-back, mikey mouse, octagonal, Paul Newman, Rolex Daytona, Special case, stainless steel, vintage chrono, vintage chronograph, vintage citizen. Bookmark the permalink. Best way is to keek an eye on e-bay. Good luck! 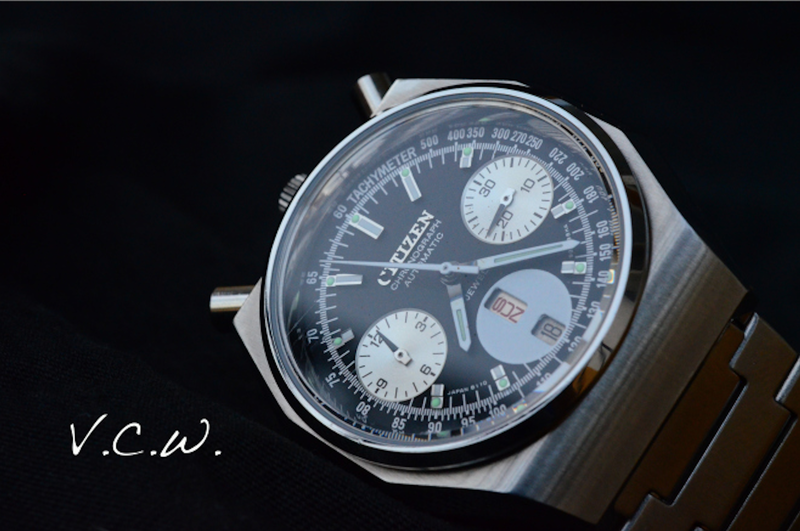 Pingback: The Citizen 67-9356 8110a Bullhead Challenge Timer - a Tale of 4 Watches - Buying and Restoring? I have a citizen bull head chronograph automatic 23 jewels #67-9313 can anybody tell me about this watch? Hi there, I have just purchased a Citizen “bullhead” Chronograph 67-9356. I’m planning to change the crystal as it is chipped. Do you know where to get a crystal replacement ? Or do you know whether Citizen 67-9356 uses the same crystal as all the other Challenge Timer models ? Hello Bernard! That is a beautiful watch you have. What dial, white or black? Unfortunately not all crystals are the same and genuine crystals are almost impossible to find. The good news is that any good watchmaker can source a replacement one that will fit nicely. Thanks! Yes, it’s a nice watch and the dial is black. I was hoping to source the replacement crystal online, it seems to be a challenge. Just thought to give it a try by asking you. I shall try my luck to find a watchmaker that can do the sourcing and replacement of the crystal for me. Thanks again! I know. 🙂 Will let you know when I have a good one. Maybe in a week or two I will have a bullhead (military green plated on bracelet). Not the octagon though. 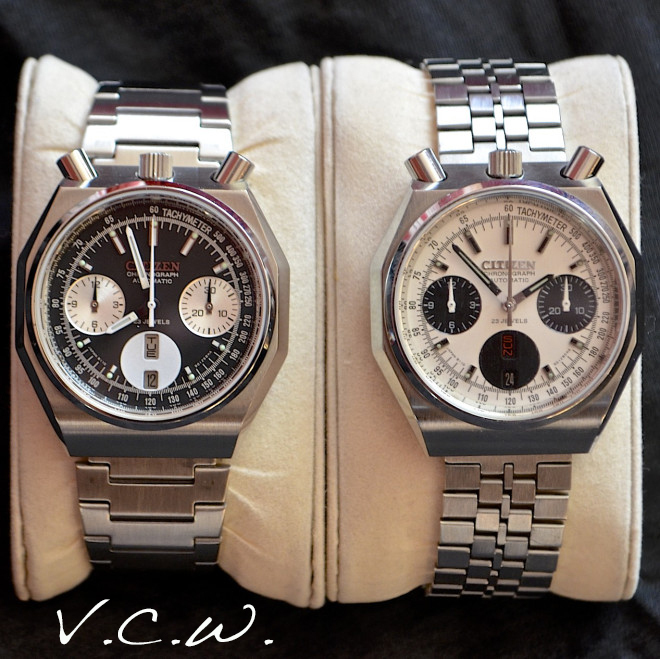 I also just picked up the 67-9356, white dialed panda version of this watch. Thank you for the informative post, it helped me pick a genuine watch amongst many fakes on eBay. At least I think it’s genuine anyway. Super! I am glad you found the information here useful. It is a beautiful watch! Wear it in good health! If you have the time, post some pictures so we can see it. Here are some pics. I had the seller send a pictire of the hour marker to make sure they had 2 levels. Your page on spotting fake dials was very helpful. It’s unbelievable how many sellers are claiming to have all-original watches yet are so obviously fake, once you know what to look for. Sorry… There are no pics attached. I thought the “website” field would populate, guess not. Here is a link, not sure how to upload actual pictures. Cool chrono! Enjoy it and thanks for the pictures! I love it! una disculpa, no soy conocedor mucho de relojes, pero este reloj usa un tipo de pila?? No usan pilas. Son de cuerda automática. great article! thanks for the specifics, I was wondering if you can tell me where to buy the original (black/white) dial, my grand father left me this watch and everything is great except for the dial, thanks! Hi, I just found this jewel and extremely excited to have in my collection. It’s NOS or at least mint condition with box and an original tag with serial. However, I do not have any experience or much knowledge on vintage Citizen watches except, what I have learn from online community. Just one question I have for your expert opinion. Is there anything you see that is NOT right about the watch? Not sure how to upload pictures for you but, I do have them.